On the 23rd April 2019 we held an ‘Investor only’ drinks reception on board The Royal Yacht Britannia. 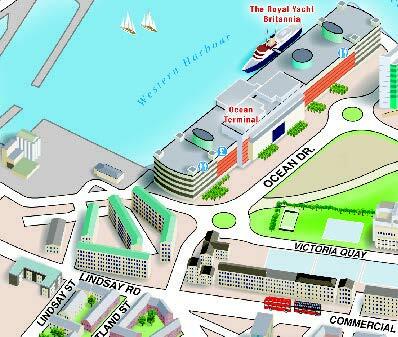 Britannia is berthed alongside Ocean Terminal in Edinburgh’s historic port of Leith, only 2 miles from the city centre. At the roundabout shown on the map below, take your first left, which will lead you to the security barrier at the south end of Ocean Terminal. From the security barrier, you will be directed along the quayside to Britannia where a member of our team will assist with drop-off. Should you require assistance on the evening, please call 0131 555 8800. For satellite navigation our postcode is EH6 6JJ. Please note that there is no access to Britannia through Ocean Terminal in the evenings. Access in the evening is exclusively along the quayside. Britannia was launched from the John Brown & Company shipyard in Clydebank, Scotland, on 16 April, 1953. For over 44 years the Royal Yacht served the Royal Family, travelling more than a million nautical miles to become one of the most famous ships in the world. To Her Majesty The Queen, Britannia provided the perfect Royal residence for glittering state visits, official receptions, Royal honeymoons and relaxing family holidays. For Great Britain, she was a majestic symbol of the Commonwealth and a proud ambassador generating billions of pounds in trade deals. For the Royal Family and 220 dedicated crew of Royal Yachtsmen, she was home.Today, Britannia is a five-star visitor attraction and exclusive evening events venue in Edinburgh.